LOGAN — When the new Aggie Recreation Center opened in November, it became the first facility on campus to house a climbing wall and rapelling ledge. It also will soon be the first campus facility with an all-gender locker room. The locker room, on the first floor of the Rec Center next to the male and female locker rooms, is currently labeled as a family restroom. 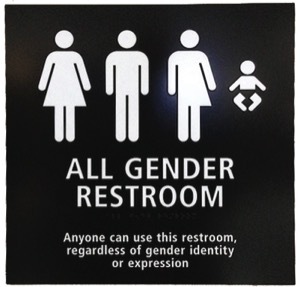 It will soon be relabeled as “all-gender,” and unisex bathrooms throughout the center will be relabeled as all-gender as well. Lambert said some people experience anxiety in gendered spaces, and this anxiety can prevent them from taking advantage of different programs or facilities. Hoping to combat this, Ellis believes having an all-gender locker room will help make the Center a place for people of all identities to feel accepted. “We want everyone to know we have a space for them,” he said.